Product prices and availability are accurate as of 2019-04-20 04:06:16 UTC and are subject to change. Any price and availability information displayed on http://www.amazon.com/ at the time of purchase will apply to the purchase of this product. 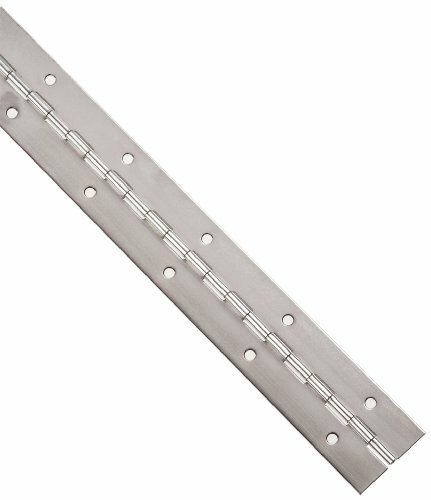 The stainless steel 304 continuous hinge has countersunk holes and is suitable for surface-mounted applications requiring uninterrupted support along the full length of the pieces being joined, such as appliance doors, industrial kitchen equipment, and metal storage cabinets. Stainless steel 304 resists corrosion up to 1,500 degrees F and is suitable for applications used in corrosive environments, though not as resistant to corrosion as stainless steel 316. A weldable material, stainless steel 304 is stronger than steel and aluminum. Since this hinge is unfinished, it is suited for applications that will not be exposed to corrosive environments. The range of motion for this hinge is 270 degrees from the folded position. Continuous hinges, also called piano hinges, provide support to run the full length of the doors, panels, or pieces being joined together. They are manufactured in a variety of materials and sizes, with or without holes, finished or unfinished, and can be cut to specific sizes. They also vary by knuckle length, pin diameter, leaf thickness, and open width. The knuckle is the tubular part of the hinge through which the pin passes, and knuckle length is the measurement of an individual section. The pin runs the length of the hinge holding the leaves together. The leaf is the flat metal portion of the hinge that extends laterally from the knuckle and revolves around the pin. Open width is the dimension from the outer edge of one leaf to the outer edge of the other when the hinge is fully open.